Practice what you preach? How apt, the brass band plays, banners and flags are waived, suited personal are all smiles, glossy literature is handed out, promises are made, "we are the best" is shouted from the rooftops. Then we all wake up and face reality. I will tell you why I call this PROPAGANDA that would make even William Joyce proud, better known as "Lord Haw-Haw". 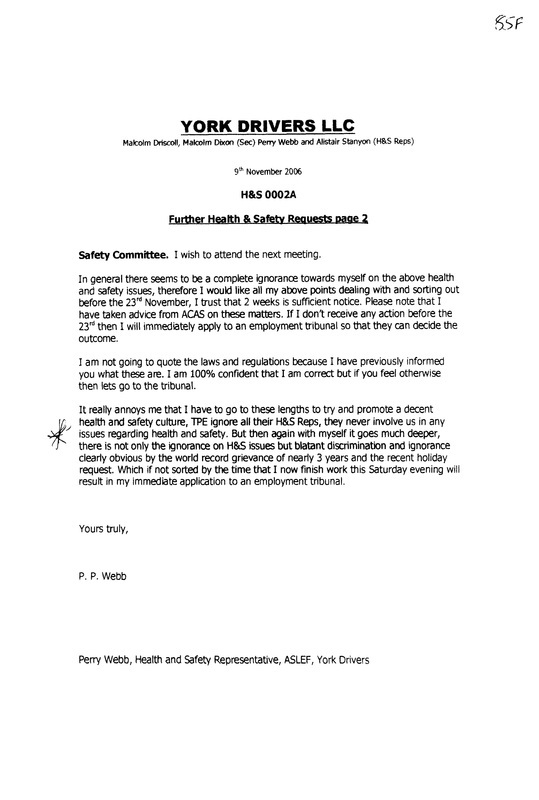 My main reason and my concern is the sheer ARROGANCE of this management, the fact that they can blatantly IGNORE health & safety at every level and get away with it by silencing their critic's. This website is living proof of the above paragraph. The health & safety concern's that I brought to their attention on a regular basis will still be evident today, lurking in the background waiting to explode, just like SUMMIT TUNNEL that was completely avoidable, what happens when we get the next summit tunnel? 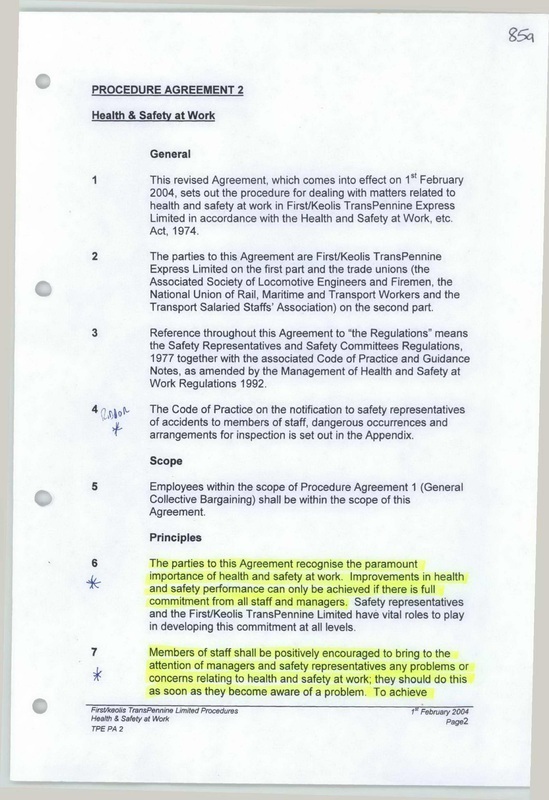 PROPAGANDA: "The parties to this agreement recognise the paramount importance of health and safety at work. Improvements in health and safety performance can only be achieved if there is FULL COMMITMENT from all staff and MANAGERS". WHY PROPAGANDA? 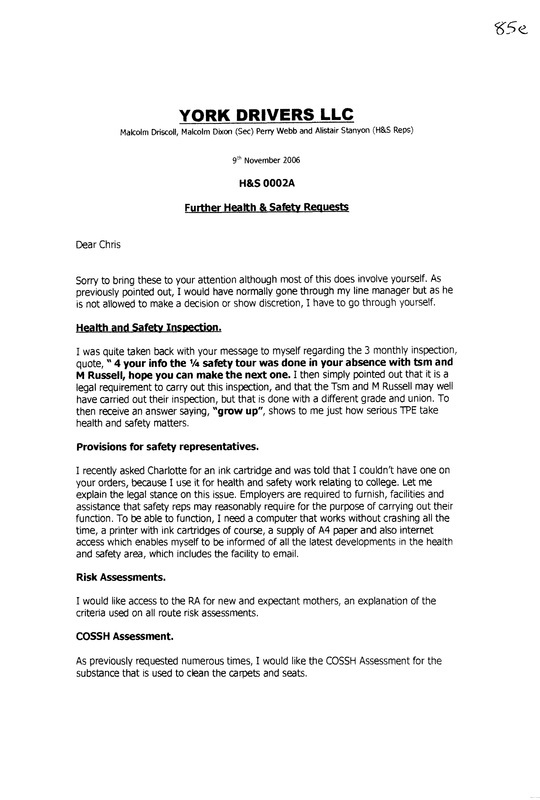 My whole website categorically proves with undisputable evidence that this TransPennine Express management blatantly IGNORED all my concern's on health & safety. All I ever did was strive to make things better, the warning horn was just one of numerous issues. PROPAGANDA: "Members of staff shall be positively encouraged to bring to the attention of managers and safety representatives any problems or concerns relating to health and safety at work. They should do this as soon as they become aware of the problem". WHY PROPAGANDA? Would you call IGNORANCE positive encouragement? 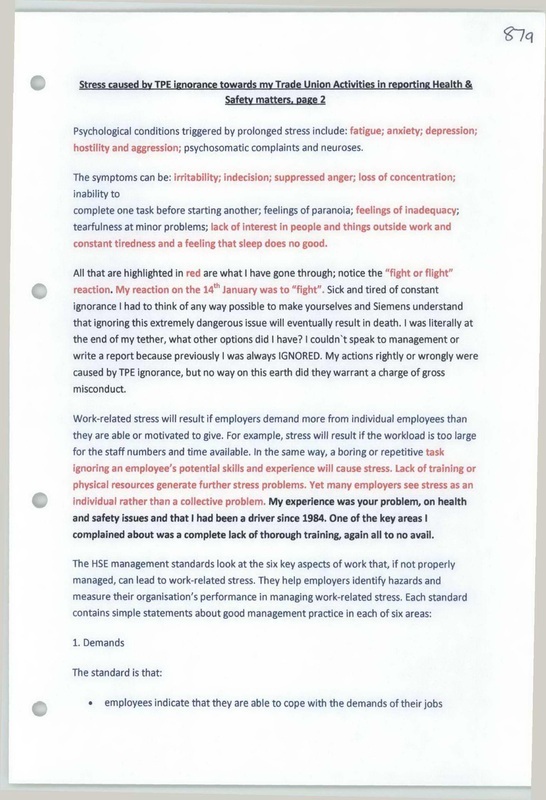 I brought to this managements attention so many issues through my reporting, verbally and in reports, I know your probably sick of reading it, but there was never any response, just a wall of sheer IGNORANCE. PROPAGANDA: "Subject to giving reasonable notice to the local manager, the safety representative shall be entitled to inspect and take copies of any document relevant to the workplace of those he/she represents". 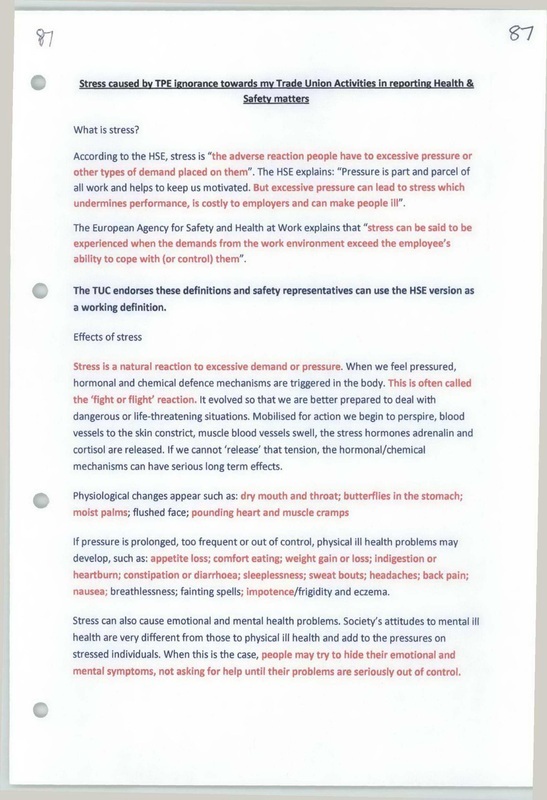 WHY PROPAGANDA: Just look at my evidence (one report of many is below) with so many requests for information, ranging from basic risk assessments and COSHH assessments to the TPE safety case, no wonder I call it PROPAGANDA. PROPAGANDA: "Libraries of information for safety representatives will be provided and maintained by local managers, allowing access by the safety representatives as required. Subject to local availability management will provide safety representatives with accommodation and office furniture as necessary including access to telephone, word processor, photocopier and notice boards". WHY PROPAGANDA? Unbelievable, absurd, an absolute joke! I asked to view the safety case, it never happened. There was no "library of information", there was no proper facilities or equipment, I was given access to a room the size of a shed that was also used by the RMT union. The only word processor we had was brought in by another ASLEF member, there was no other equipment to use. One other EXTREMELY RELEVANT POINT about this room is that it was on the first floor of a building next to what TPE would call a messroom. I complained that if there was a fire in this building, there is no means of escape via a fire exit, because one doesn't exist, I reckon it will still be the same today, but who cares? PROPAGANDA: "Safety representatives will be given time off with pay in accordance with the regulations. 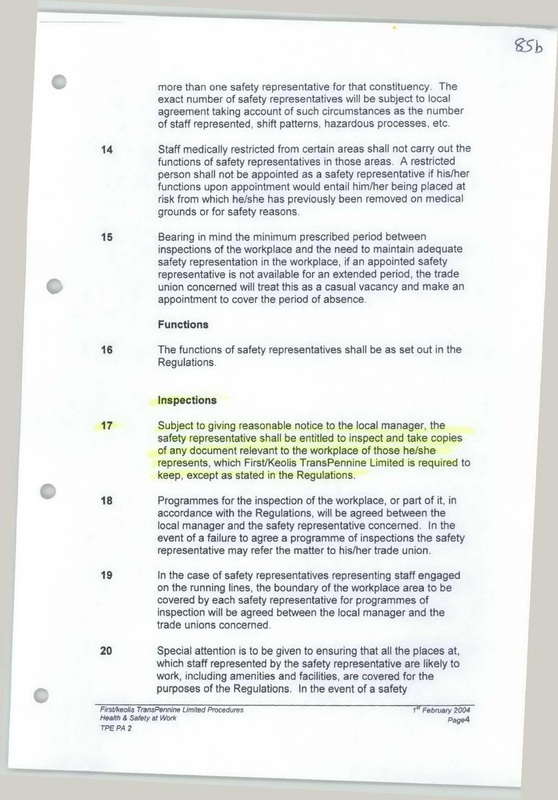 (ii) To attend such courses on health and safety at work matters related to their functions as are agreed to be necessary by the parties to this agreement". WHY PROPAGANDA? 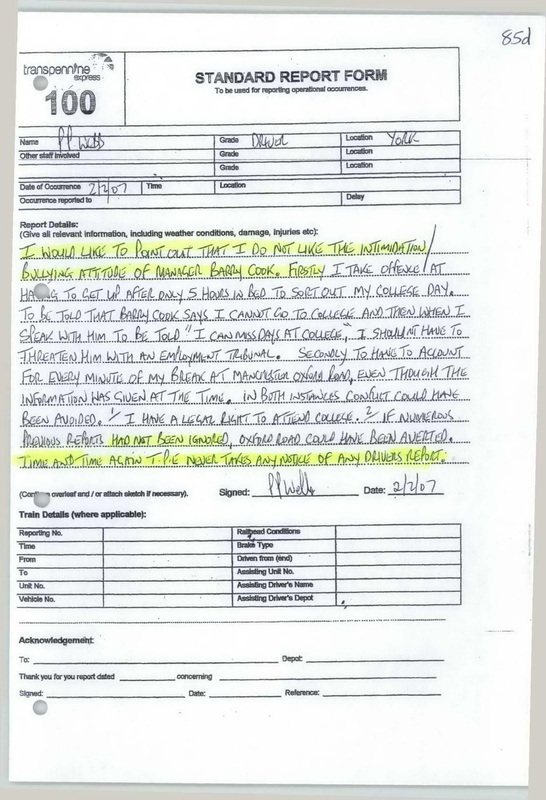 MY REPORT below was made because Barry Cook informed me via control that I had to work a diagram instead of my college day for health & safety. They phoned me at 05.00 to explain this, expecting me to work at 07.00hrs. 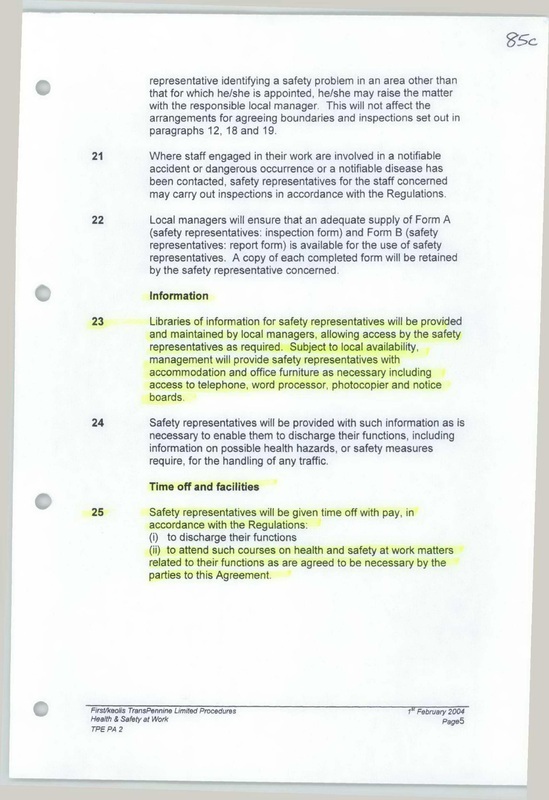 Following on from the above agreement, the report below once again highlights why I call this Health and Safety at work procedure agreement 2 nothing but PROPAGANDA, what TPE have written is a pack of LIES as shown below. Above you will see that I asked for a risk assessment for new and expectant mother's, the reason for this was that the toilet facilities for women at York did not have any running hot water and hadn't for 2 years, I shouldn't have to explain to anyone my reasoning behind this request unless you are as IGNORANT as TPE MANAGEMENT were. The final paragraph below should be enough to make anyone who has a decision to make on this franchise as well as any prospective employers of this rabble of a management really think about their decision. It shows me as an health and safety representative who has put up with such RUDE IGNORANT BULLYING MANAGEMENT actually trying to obtain a response, it was a cry for help, which as usual and was always the case IGNORED. 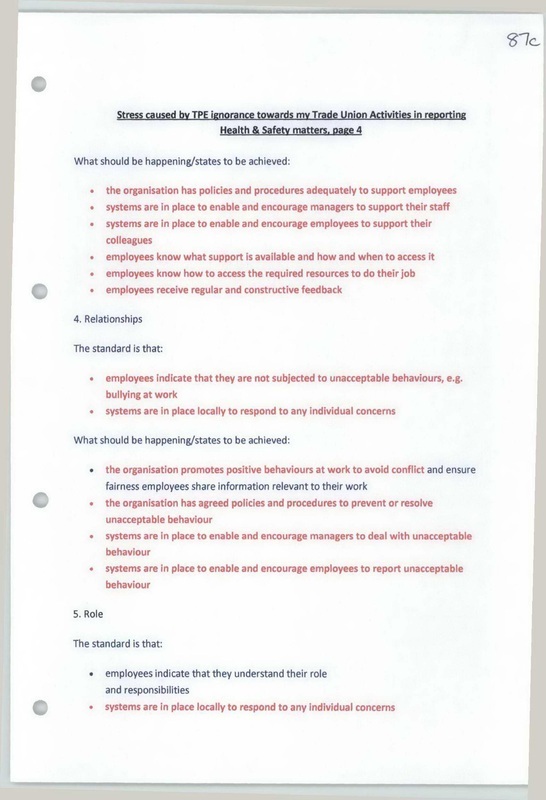 The following report is what I actually went through as health & safety representative, this is further reason why this shambles of a management should never be allowed to run a train operating company or indeed be employed by one ever again.